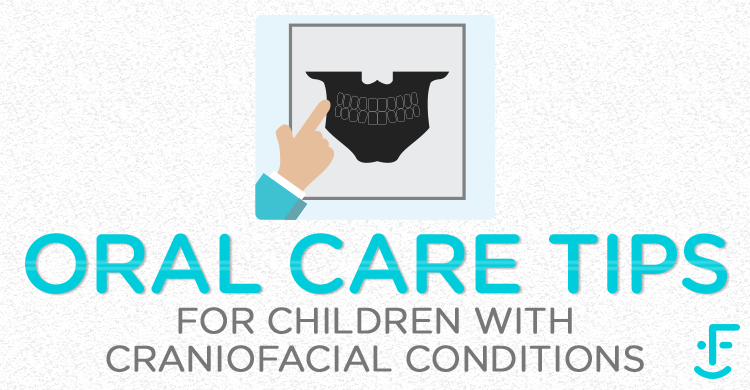 Craniofacial conditions can affect the teeth thus making home care and dental treatment difficult. A small mouth, difficulty opening wide, crooked teeth, and soft or irregularly shaped teeth can all contribute to a challenging situation. Starting tooth care early can prevent a lot of difficulties later on. Parents of children with craniofacial conditions can start caring for gums and teeth as early as one month old (even if baby teeth haven’t come in yet!) unless told otherwise by their doctor. Wipe the gums and teeth with a soft cloth, gauze, or baby toothbrush that fits on your finger – this helps keep the mouth clean, and helps your child get used to you cleaning their teeth. Parents should seek professional care early on. Your child should see a dentist within 6 months of their first tooth coming in, and by 1 year of age at the latest, so that your child doesn’t wind up with painful cavities later on. A pediatric dentist can deal with young children and those with special needs. Always try to make things FUN! A happy child at home will make a happy child in the dental office. Listen to your dental professional. They may suggest more frequent cleaning or visits for your child to get more comfortable in the office. For many children, twice a year is not enough – they may need to see the hygienist or dentist 3 or 4 times a year! Try asking for lessons on proper brushing technique, not only for your child but for yourself as well. A separate appointment can be set aside for this. When your child shows signs of wanting to brush on their own, always check to see that they did a good job and reward or praise them if they did. Remember it may be necessary for you to rebrush after. As a rule of thumb, your child may be coordinated enough to brush their own teeth effectively once they can clearly write their name in cursive (handwriting). For those children with hand anomalies it may be difficult. There are special toothbrushes and aids designed to help that are widely available today. The way to get the best oral care for your child is to start early, be consistent, and find a pediatric dentist that you trust and who understands your child’s needs.